Serpentine are one of the new wave of metlodic rock bands, and are growing in popularity. At the moment though they're a slightly odd band as the lineup you may have seen on tour earlier in the year and which will be on the next tour, is different to the lineup that is on the album. The difference in lineup is in vocalists - the current vocalist is Matt Black (who does an excellent job in the live shows), but on the album it's Tony Mills (TNT, Shy etc). Under normal circumstances, Matt Black would have done the vocals on the new album but due to contractual issues (the band had a signed contract to record two albums with Tony Mills) then this their second album has been recorded with Tony Mills. It's only the Japanese who get to hear Matt Black's vocals on the album - the Japanese special edition of the album comes with a bonus track with Matt's vocals, but the song (Lonely nights 2011) is on youtube for fans around the world to listen to (and its well worth a listen). 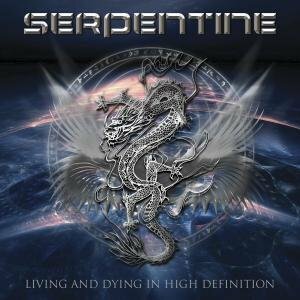 "Living and dying in high definition" is Serpentine's second album and is keyboard led melodic rock, but with enough guitar work to give it a slightly harder edge. "Deep down (there's a price to pay)" is a great opening track for the album, opening with keyboards before the vocals of Tony Mills and then the guitars kick in. "Philadelphia" kicks off with a nice chunky guitar riff before the keyboards kick in. I can see this being released as a single - its definitely got that feel. "Love is blue" has a classic AOR ballad feel to it. "Cry" is another catchy well written song - one of many on the album. The album may only have ten songs but most of the songs are over five minutes long so you get over 53 minutes of music - a good length for an album these days. The band's debut album impressed a lot of people and gained them plenty of fans, but "Living and dying in high definition" takes a huge step forward in quality and is really going to boost their reputations a lot. A great album without a single weak track on it.